Beth Gutcheon enjoyed instant fame among those seriously interested in crafts upon publication of her first book, The Perfect Patchwork Primer. In response to requests from across the country, she now has created a new kind of quilt book — a workbook that takes the guess-work out of patchwork, The Quilt Design Workbook. Designs range from a simple beginner’s quilt that takes only 30 hours to make from beginning to end, to richly complex varieties that will excite the experienced crafts person. Each design has complete step-by-step instructions for cutting and sewing. 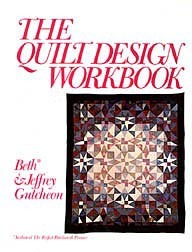 Instructions for designing, cutting, piecing, appliqué sewing by hand or machine, quilting with or without a frame, and much more are here in this unique and beautiful workbook.